This website highlights the most popular Java logging frameworks, tools and tutorials. If you are looking for a Java logging tool or if you want to learn more about Java logging in general, you found the right place! Please see below for popular tools, frameworks, articles and web links. Also make sure to take a look at the Java Logging Comparison and Concepts & Features pages with explanations of the basic features of logging tools and libraries. What's logging and tracing anyway? What's Java logging and tracing anyway? Logging and tracing refers to automatically recording events and data structures about a software program's execution to provide an audit trail. Developers, testers and support personal are using the recorded information and data to identify software problems, to monitor live systems, for auditing purposes and post-deployment debugging. Commons Logging is a bridge between different logging implementations. Libraries that use the commons-logging API can be used with any logging implementation at runtime. Craftsman Spy is an open source and free framework for JDBC logging that features its own JDBC driver implementation. Houston is a lightweight logging toolkit for Java offering a plug-in architecture to choose the underlying logging toolkit such as log4j. jLo is a logging framework for Java that supports different logging levels, targets and channels. 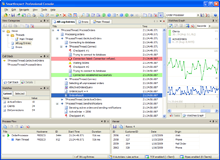 This tool is a Java monitoring system that allows you to control and supervise Java applications with the main focus on the logging subsystem. JTraceDump provides a facility to keep a history of application processing steps in memory and dump or log it in case of an error. Limpid Log is a logging framework for debugging that can be used without writing any log statements. Log4j is a Java logging framework that supports logging to files, OutputStreams, io.Writer and other targets and allows the configuration via config files. Logback is intended to be the successor of log4j. It was developed by the original log4j developer and features a lightweight architecture. A tool that improves the reliability of Java applets and applications with its message logging and tracing capabilities. Monolog is the logging API for the ObjectWeb project. Monolog supports multiple log levels, application monitoring and contains special features for internationalization. ObjectGuy Logging Framework for Java supports logging to the system Console, a file on disk, via TCP/IP and memory. Protomatter includes a logging library that supports logging to the standard syslog UNIX daemon. A simple logging framework for use in web or standalone Java applications written entirely in Java using the java.io package. Simple Log is a small and simple logging library and requires you to do almost nothing (other than actually logging) to get log output happening. SLF4J is a framework that acts as a simple interface for various other logging libraries allowing developers to plug in the desired implementation at deployment time. SmartInspect is a logging tool for debugging and monitoring Java, .NET and Delphi applications and includes a unique log file viewer and real-time monitoring application. TraceTool is a logging library and viewer application for different programming environments, including Java. 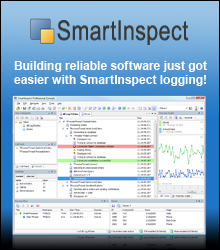 We are also happy to introduce you to our own SmartInspect Java logging tool. If you are looking for a professionally supported modern logging solution for Java, you should definitely give SmartInspect a try. It comes with logging libraries for Java, .NET and Delphi and includes a powerful viewer and monitoring application. This article explains the basics of Java's built-in logging capabilities and features and shows how to use this logging API in applications. This article explains the general concepts of logging with Java and highlights some of the key comparison facts when evaluating a logging package. This is an introduction article to the Java logging API that highlights some of the basic features of the JDK's logging package. This article will help you choose a logging API by evaluating two of the most widely used Java logging libraries: the Apache Group's Log4j and the java.util.logging package (referred to as "JUL"). Aspect-oriented programming (AOP) enables you to write functionality and apply it declaratively to existing code. Logging is a prime candidate for implementation as an aspect, and Spring offers the AOP framework to get it done. Don't reinvent the wheel when adding event logging to your Java apps. Follow these examples, you can be using the Log4j package to capture your application events.